America’s Cup is coming and you’re going to want to be there. And here is your front row seat. You will be “court-side” for the world’s premier yachting event. Your seat is a 41’ CHB Heritage Aft Cabin vintage 1981. 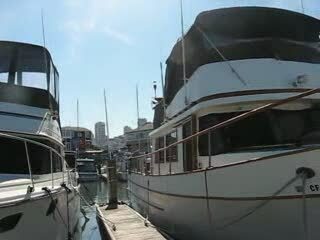 It is berthed at San Francisco’s Pier 39, around the corner from Pac Bell Park and McCovey Cove. From your berth will be able to view the races from a very special flybridge. 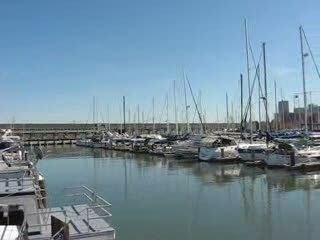 Or you may choose to view the races from another perspective on the Bay itself. From E-Dock the entire Central Bay is five minutes away. 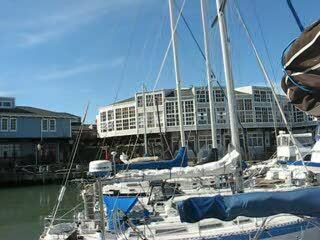 You will be on the Bay directly opposite Alcatraz and Angel Islands. 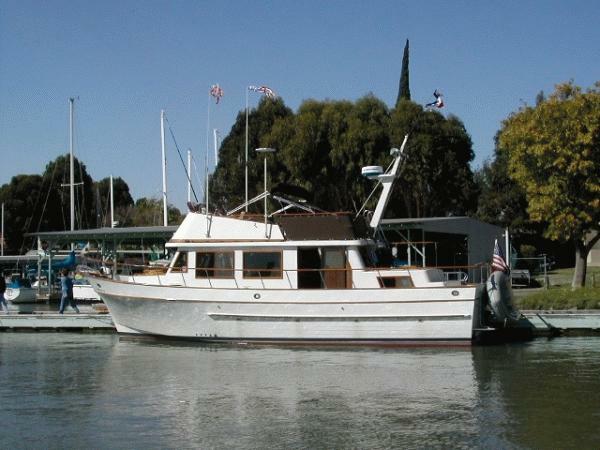 “Chardonnay” is a very economical boat to run. 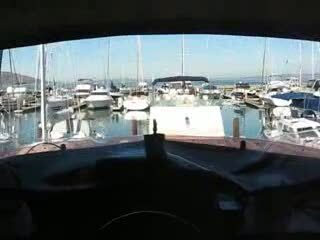 If you decide to motor out to the “Cup” or to Fleet Week, Opening Day or the jump to Sausalito you will be using less the 2.5 gallons/hr at a 7.5 knot cruise on the renowned Ford Lehman 120. She has excellent manners at sea based on a well found hull with a very effective, high bow flair, very high freeboard and a full length keel for directional stability and protection of the prop. She is a safe boat with high full stantion railings all round and 360 degree visibility from the flybridge. 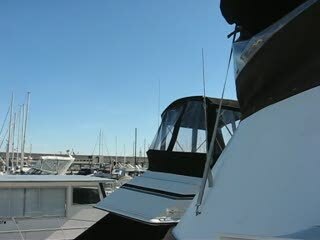 This makes her an excellent family boat with superb entertaining capability. She can sleep eight, but entertain up to fifteen with ease. The expansive flybridge is now protected with a new double-panelled, heavy duty canvas and can seat six. 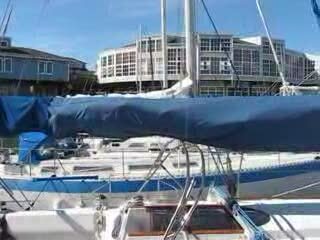 This greatly expands the upper deck surface and useful deck area. It’s also warm enough to keep the bridge “toasty” during the Bay’s cooler days. 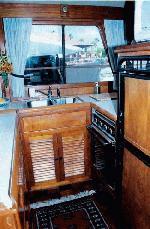 The interior of the Chardonnay is a showplace of the finest teak paneling and cabinetry throughout. She is an excellent representative of the trawler class. She features cabins Fore&Aft. The Master features a queen center-line berth and a NEW full head with tub shower. 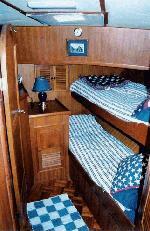 The forward cabin carries two double bunks and a full “wet” head. Chardonnay is in excellent condition, which reflects the owner, a fastidious and careful sailor with many years at the helm. 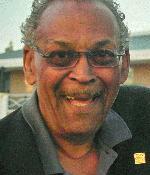 He describes Chardonnay as one of his best boats ever. This will become apparent as you tour Chardonnay yourself. 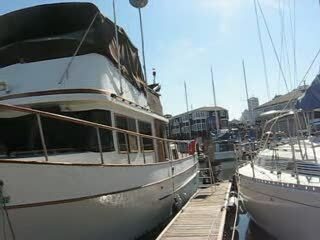 You will find a boat that has traveled to Alaska and Mexico, trips for which she is designed and equipped. As you might expect, the engine room is immaculate and reflects the care and maintenance this vessel has received. A 4.5 kw Westerbeke generator in a sound shield and a Freedom 2500 watt Inverter provide ample 110v power while at anchor or underway. In sum, “Chardonnay” is a dream come true for the fortunate person or persons looking to invest in a brilliant, fun-filled future. You can rest assured that this deal will not last.